Ingenuity especially designed the Simple Comfort Cradling Swing to make mom's day more simple and convenient, without breaking the bank. This innovative oversized seat with adjustable recline rotates 180 degrees to keep baby in better view of mom, and baby can swing in not 1, not 2, but 3 directions. The super lightweight frame has wheels and a convenient easy-to-pull handle which make it simple to move this full-size swing from room to room. Moms, you never have to spend money on batteries with the included AC adaptor. 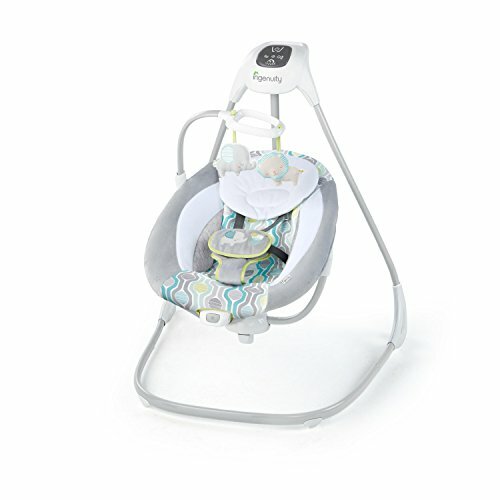 From the Gentle Touch control panel, customize baby's experience with soothing vibration, 8 melodies and 3 nature sounds. Get a few hands-free moments with a swing timer that can be set to 30, 45, or 60 minutes. True Speed technology maintains 6 consistent speeds-even as baby grows. Whisper Quiet technology allows baby to swing in silence. The mobile is adorned with 2 adorable plush characters for baby to engage with while they are cradled in soft fabrics. When things get a little messy, the seat pad can be removed and tossed in the washing machine. The tasteful fashion is sure to compliment the decor of any home and is perfect for a girl or boy.